The contents of this news article has expired and is no longer relevant. Upgrade to the latest wide format print & cut technology from Roland DG and experience the benefits of lower running costs, improved colour and quality, and the assurance of a comprehensive warranty and industry-leading support. 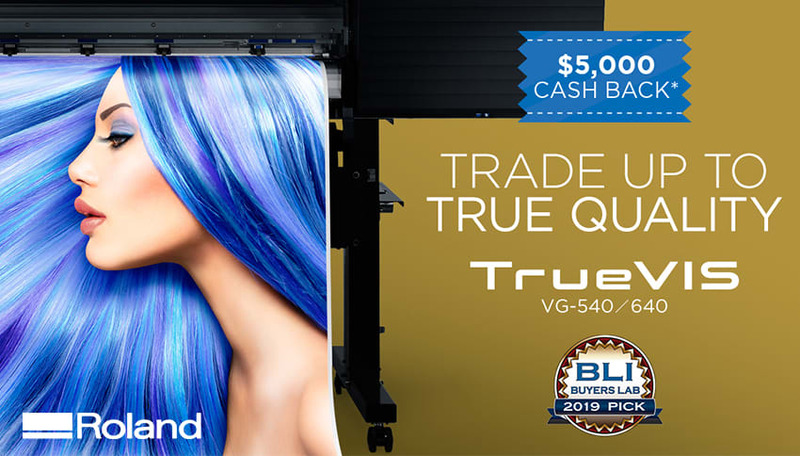 BLI Buyers Lab top choice for image quality and productivity, the TrueVIS VG Series provides unparalleled colour output, reliability and integrated print and cut versatility. Upon completion of the trade-in, Roland will transfer your $5,000 cash back! Visit the Roland DG Australia website for full terms and conditions and to register your trade-in. *Terms and conditions apply. Valid until 08/03/2019. Visit the website above for further details. GJS is Australia’s premier provider of solutions and services for the textile, promotional products, custom photo gift, sign and display industries. With over 41 years’ experience, GJS supplies everything needed to start and operate a successful printing business including equipment, consumables, training and support. Headquartered in Revesby, NSW, and with additional teams located in Victoria and Queensland, GJS serves customers throughout Australia, New Zealand, and the Pacific Islands. For more information visit: gjs.co. GJS and the GJS logo are trademarks or registered trademarks of GJS. Other names are trademarks of their respective owners.